IVECO customers confirm that commercial vehicles have different missions every day; itineraries may be urban or extra-urban, with straight or more winding roads, and loads may be different. Based on these requirements, the IVECO demonstrator configuration enabled immediate traction switching, depending on the type of itinerary and conditions, in this way making an important innovation towards environmentally friendly mobility. Introduce new control and sub-systems to ensure the flexibility of the system on the one hand, and to improve the powertrain efficiency with respect the diesel version on the other hand, using the best electrical and thermal management. Build a prototype that integrates modular components coming from MSF. The IVECO demonstrator is a Daily 7t and has a plug–in diesel-electric parallel hybrid architecture. It is designed to reduce fuel consumption and CO2 emissions compared to the diesel version, to increase the range and to avoid “the range anxiety” that is typical of pure electric vehicles. The ghost view in Figure 5‑8 gives an overview of the innovations that have been developed. Flexible driving – The demonstrator has extremely flexible technology, capable of switching to the most appropriate source of energy and operative modes depending on the vehicle’s mission and system conditions, using a customized hand lever and a specifically designed transfer box. See Figure 5‑12(a). 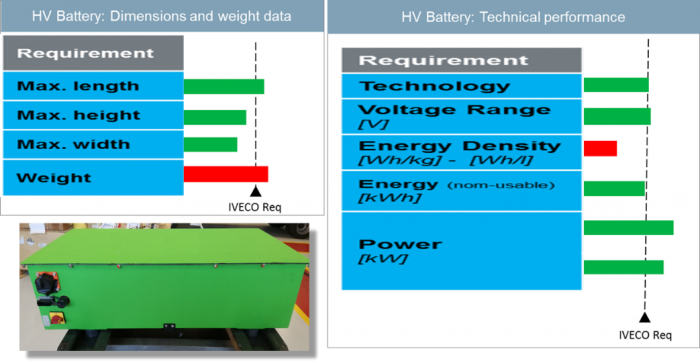 Modular – Some modular components, like the BOSCH HV battery, RESS and the smart DC/DC converter developed according MSF guidelines with the HV high efficiency E-Drive, and a 3-phase AC charger, have been integrated in the demonstrator. See Figure 5‑12(b). Flexible charging – The system satisfies all customers’ requirements, retaining the flexibility of private Mode 1 with CEE type connectors, Mode 3 public charging capability with type 2 AC connectors, and domestic-charging. See Figure 5‑12(c). The vehicle architecture is shown schematically in Figure 5‑12(e), where the components developed according the MSF guidelines are highlighted in green. Figure 2 (a) Flexible driving. (b) Modular components. (c) Flexible charging. (d) Dedicated human-machine interface. (e) Schematic overview of the vehicle architecture, with the MSF components highlighted in green. The HV battery system has been designed in order to allow for modular components for multiple batteries. A prototype battery management system (BMS) coordinates the whole system through specific software and is the interface with the IVECO vehicle supervisor. The only negative point is the energy density results in a smaller payload capability. With the 21 kW.h battery all final targets were reached, and almost all the IVECO requirements. The HV battery technical data are given in Table 5‑12 with the IVECO requirements as reference. As Figure3 (b) shows, all technical performances meet the IVECO requirements. The multimodal transfer box is the core of the system. In the parallel hybrid layout a mechanical power transfer unit is needed to connect the ICE with its gear, the EMG and the final driveline. The driver or by the vehicle control system can decide on the configuration. The selected hybrid architecture makes the system very flexible, the big advantage being that the components in the existing driveline do not have to be changed. At the same time, the ability to disconnect all the mechanical parts makes the solution very efficient. 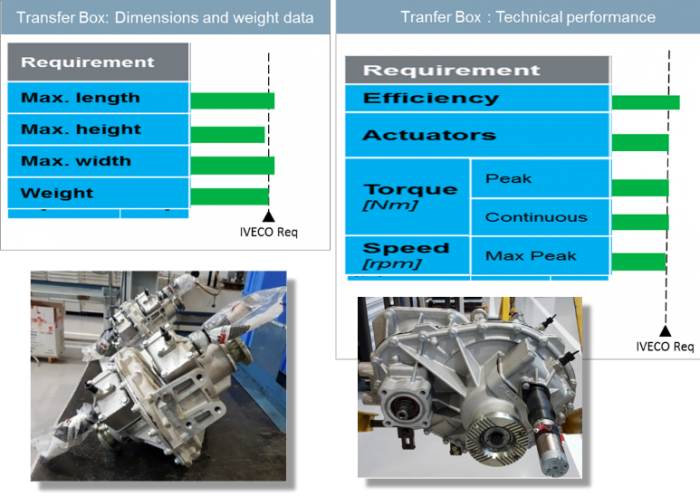 The concept has been designed for maximum simplicity for cost and weight optimization: one stage of reduction, a dog clutch connection and wet sump lubrication. As Table 5‑13 shows, the system meets all the IVECO mechanical requirements. The driveline of the IVECO demonstrator has been designed for optimal performance and to allow the regeneration in most of the vehicle missions. The power density of the system reached a very good level. The assessment of the IVECO demonstrator has been performed taking in to account the targets described in Section 4.3.1. The final assessment has been carried out between November 2017 and March 2018 at the CNH-IVECO facilities in Turin (Italy) under the supervision of the Golden Engineer. vehicle was not applicable to benchmark all the assessment criteria, therefore two references were necessary. Table 6 Main technical results for the medium duty truck demonstrator. The hybrid demonstrator is significantly more fuel efficient than the reference, allowing for an energy consumption reduction measured on the IVECO proprietary test cycle ranging of between 21.7% to 25.5%, equivalent to a powertrain energy efficiency improvement ranging from 27.8% to 34.4% with the vehicle half-loaded (vehicle weight 5.2 tons). The demonstrator emits 7.3% less carbon dioxide per km driven and per kg of payload compared to the reference. 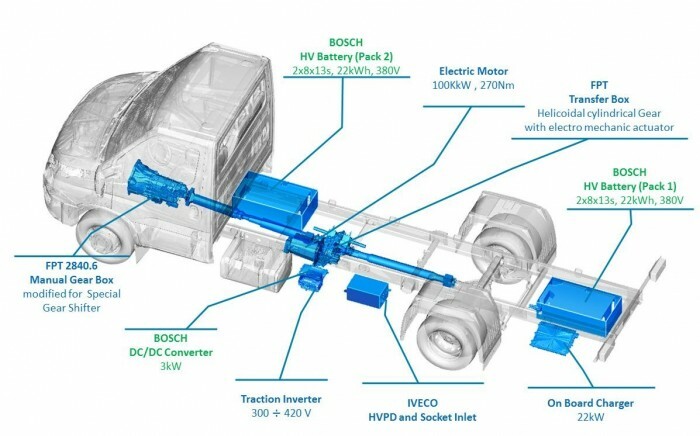 The electric part of the hybrid powertrain of the demonstrator is ≈36% smaller in volume and ≈27% lighter than the reference vehicle, doubling the volumetric and gravimetric peak power and torque, and tripling the volumetric and gravimetric continuous power and torque. The vehicle is fully compliant with EURO VI emissions regulations, verified by PEMS tests and it meets or exceeds all performance parameters, allowing a full recharge in approximately 70 minutes (industrial plug three-phases at 380 V accepting 1 1kW constant), satisfactory acceleration and operational performance (both in hybrid and in full electric), and a fully electric range of approximately 30 km in urban driving. Comfort, ride and handling and NVH performance are fully satisfactory being equal or better compared to the reference. The vehicle meets the required safety standards, reliability and durability requirements, it is easy to operate and to recharge and is equipped with a clear and intuitive HMI for feeding the driver with the relevant information on the functioning of the hybrid powertrain. Due to confidentiality reasons and competition rules, the cost of the demonstrator vehicles cannot be made public. In conclusion, the result of the assessment is excellent, and the ECOCHAMPS IVECO Daily Hybrid 7.5 tons meets all the targets set for the project, constituting a significant advancement beyond the 2013 state-of-the-art and paving the way for the next generation hybrid medium duty vehicles. The overall TRL of the demonstrator is evaluated at level 7 (system prototype demonstration in operational environment).